September of 19th. I woke up at 9 a.m. I'm being lazy first, and go to take a bath at 9 a.m. I am getting ready and pick up my old friend to go along, She's Nadya Dewi. We leave at 12 noon. When we arrived, the audience was a little, and i think this is really boring. But at afternoon comers is more and more . Many cultural performances West Java is shown at the festival. Yet i am not watching her except the show of 'Keluarga Paduan Angklung 3' they played some songs instrumental and made impression. Then, i just sit from exhausting and bought many foods and drinks. Here i met some of my old friend, and it makes me think that 'GAMARVANI' are truly very popular. 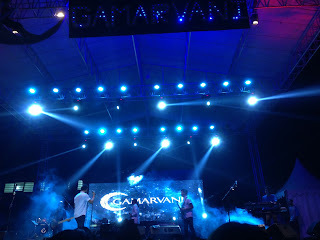 Oh yea, about 'GAMARVANI' , according to the committee, gamarvani was taken from the concept of the story of "Nyi Anteh" that was Lord removed to the Moon, because afraid that there was the hurting heart , said 'GAMARVANI' itself derived from latin Gamar which means a journey and Parvani which means to the moon . So as to have the same meaning with a the story of "Nyi Anteh" . Responsible for the event is Muhammad Ababil Akram ( Kang Abil ). The activity of what i did there only walk around with my old buddies , and sit because of fatigue . 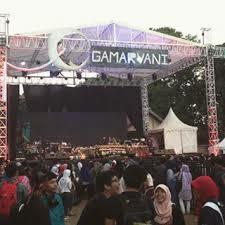 At the time of maghrib, I go to the toilet, but i should to queue up, so i spent almost half an hour to go back and watch 'GAMARVANI' . When i get back , what a coincidence the event of collaboration extraculicullar implemented , they all show appearance very debonair which , and not a little bit of there that audience applause everytime . After that , the committee conduct checks sound last to the appearance of two famous artist . This check sound spend time until 1 hour . After that at 8 p.m. the show of 'ADERA' was displayed , and wow! his voice was very good , he sing many songs , of his song and covering a song from other artists. Many of the audience here that follow a song sung . Spent long enough , the audience here were also seen increasingly . When the show adera finished, the audience here getting excited and chanting the name of 'HiVi'. Wait a moment to "HiVi" to perform, the audience here too many shouted enthusiastic. Hivi sing much of it and yes when they sang some of its popular, the audience here sing along to aloud even voices audience is harder than HiVi's sounds. And yes i admit i keep some of the song of them for their songs very easy listening. I was excited because i can hear them singing directly. Many of the audience here it seems very loves HiVi. After that, I came home at midnight, I came home using by motorcycle. So exhausting and i feel so much pain on my feet. When i got home i immediately cleaned up and go to sleep. A very encouraging. Thanks 'GAMARVANI'!! !